A calm SYRIZA and Greece said “no” to debt talks with EU-IMF troika. The new finance minister of Greece Yanis Varoufakis bravely opened in Athens the Pandora’s Box for the Eurozone and euro-dollar system. With just a simple “no” to the EU-IMF troika Greece is now on the way out from the Eurozone. Greece refuses to discuss the “toxic and anti-European” austerity and bailout conditions with the "troika", the combined euro-dollar team, but can talk with Eurozone leaders. Varoufakis said that Greece does not need in the end of February another € 7 Billion tranche from the “troika” as bailout money. His message was clear on Friday during a very chilly and short meeting with the Dutch finance minister Jeroen Dijsselbloem, who represented the troika, and walked quickly and silently out from the press conference after Varoufakis said “no”. Instead, Greece want to discuss directly only with Eurozone leaders (read: Merkel and Germany), but observers say that Germany will not compromise. So, Greece goes out from the Eurozone. This means that Greece might start again to print its own money (drachma), get financing e.g. from BRICS and Russia, while the PIGS (Portugal, Italy, Greece, Spain) plus Ireland might be tempted to follow the example of Greece and abandon the Eurozone. Out from this Greek Pandora’s box might also sail a “Black Swan” (the impossible thing, until it happens) or a beginning for a financial meltdown for the Eurozone or the Western euro-dollar based EU-IMF system, if many others will follow the Greek escape. The financially mighty BRICS countries (Brazil, Russia, China, India and South Africa) are already sailing away and have established an own BRICS Bank. The EU-IMF Troika and Greece has a completely different policy, body language and dress code. Djisselloem was symbolically like the stone-faced funeral entrepreneur dressed in a dark suit, tie and white shirt. 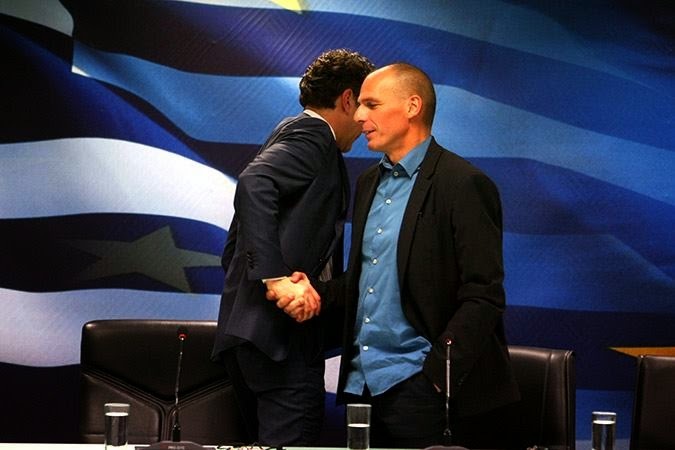 But Varoufakis was smiling and dressed in a very casual open turquoise shirt. This will certainly increase the appetite for the PIGS (Portugal, Italy, Greece and Spain) plus Ireland to look for escape routes from the austerity in the Eurozone - and the euro-dollar system. The PIGS might also want to print its own money and find alternative financing. Perhaps the new BRICS bank and/or Russia will give a helping hand to the PIGS. Certainly, it will also increase the appetite for Great Britain to take the final step out from the European Union, as the most likely next Prime Minister Nigel Farage has been a stron advocate for. Greece is - like the PIGS countries - under a heavy and “toxic” austerity program imposed by the previous governments and the “troika”. But the new Greek government with Alexis Tsipras will put an end for this. Greece owes € 320 Billion and in this sum is included a bailout of € 240 Billion in 2010 from the “troika” the European Commission, International Monetary Fund (IMF) and European Central Bank (ECB). The Doomsday Clock was just reset: It’s now “Three Minutes to Midnight,” warns the Bulletin of Atomic Scientists. It’s loud ticking is a grim reminder, as Joe Romm put it on ClimateProgress, that “Earth’s rate of global warming is 400,000 Hiroshima bombs a day.” Yes, a civilization-ender, and yet, Gallup polls dismiss the warning — the public doesn’t consider climate change a major national priority. Yes, global warming is as powerful and lethal as 400,000 atomic bombs exploding daily, said James Hansen, former head of NASA Goddard Institute of Space Studies. America is addicted to Big Oil. But paradoxically, that’s numbing us to the terminal ticking sound of the disasters ahead. Our brains are trapped in denial — not just Big Oil and their right-wing climate-science deniers — but more than 100 million average Americans. We’re deaf. Dumb. Blind. To the threats. Jeremy Grantham’s GMO firm manages $120 billion, warns that “We’re running out completely of potassium (potash) and phosphorus (phosphates), both essential in food production, and eroding our soils.” Worse, Grantham’s research indicates they “cannot be manufactured and cannot be substituted for.” Total depletion will make it impossible to feed the 10 billion people predicted on the planet by 2050. Diamond says “this argument misses in two ways: That First World countries do or can produce more food than their citizens consume. And surplus First World food could be exported to the Third World.” And that will “alleviate starvation.” Bad assumptions: Rich nations have large poverty too. Plus we know China and the Saudis are already buying and hoarding millions of acres of land in poor countries. Distribution is not a problem, greed and the politics of inequality is. Yes, “for affluent First World citizens,” says Diamond. Plus public-health advances have “increased life spans in the Third World. But life span is not a sufficient indicator: billions of Third World citizens, about 80% of the world’s population” still survive on a few dollars a day. And as Nobel economist Joseph Stiglitz, author of “The Price of Inequality,” put it: “There is less equality of opportunity in the United States today than in almost any advanced industrial country.” The inequality gap’s widening, the top 1% captured 93% of the income growth since 2008. Yes, some predictions by environmentalists proved incorrect. But it’s “misleading to look selectively for environmentalist predictions that proved right, or anti-environmentalist predictions that proved wrong.” The world is headed for an increasing frequency and intensity of climate disasters. The recent 166 mph supertyphoon in the Philippines was the largest ever recorded, leaving 1.5 million homeless. Critics dismiss overpopulation by arguing that “the rate of increase of the world’s population is decreasing,” meaning that “world population will level off at less than double its present level.” But Diamond warns that “even if it does, the world’s present population is already living at a non-sustainable level ... the bigger danger is the increase in human ‘impact’ as the Third World achieves First World living standards.” Why? Developed nations consume 32 times more resources, dump 32 times more waste than do undeveloped nations. This one is dumb and dumber: Assumes population growth will continue forever. Diamond says it “can’t be taken seriously.” This myth is perpetuated by our misguided economics profession as the justification for the excesses of capitalism. Today the economy is choking on this myth that’s being challenged by critics, contrarians, environmentalists, ecologists and billionaires and power-players like Tom Steyer, Hank Paulson and Michael Bloomberg. As an anthropologist, Diamond has travelled to many Third World countries, and documented their damaging environmental problems. What he’s discovered is that the Third World is quite well aware of global warming, climate change and the impact of environmental disasters on their world. They know very well how they are being harmed by population growth, deforestation, overfishing, and other problems. And how globalism and giant corporations like Exxon Mobil are too often the culprits. Warning, today it’s too hot, by 2050 it’ll be too late. Some 8,000 Ukrainian troops are believed to be surrounded near the village of Debaltsevo in Donbass, as militia units cut off the only road linking the pocket to Kiev-held territory. The servicemen have been offered the chance to surrender. The forces of the People’s Republic of Donetsk (DPR) have stormed and captured the town of Uglegorsk, a stronghold of the Ukrainian army in the east of the country used for communication and supply. It is about 10 kilometers from Debaltsevo. This situation map reveals a large #Ukraine force surrounded in the Debaltsevo cauldron by the #Donetsk boys. Ukrainian MP and commander of the Donbass volunteer battalion Semyon Semenchenko, says on his Facebook page that Uglegorsk has been abandoned by Ukrainian forces. Semenchenko claimed that the rebels attacked his unit from the rear. Donetsk People’s Republic head Aleksandr Zakharchenko says Uglegorsk was captured in a violent“dawn-to-dusk operation” and offered enemy troops to surrender, promising to spare their live. “Guys, my proposal is to lay down arms and surrender. You’re fighting the wrong people. You have the only chance to save your lives. Surrender and you will live. I promise that all of you will return home afterwards,” Zakharchenko said. Following the offer, 11 Ukrainian soldiers have already “crossed the DPR’s border” and surrendered to the rebel forces. “Their lives are not in danger,” DPR Defense Ministry spokesperson Eduard Basurin said. Meanwhile, the Lugansk Republic’s forces are currently battling for the town of Popasnaya, Basurin said.“If the LPR militias capture Popasnaya and move towards Artemovsk – there will be yet another pocket to the north of the one near Debaltsevo,” he warned. Meanwhile, Kiev authorities have reportedly empowered army commanders to gun down deserters on the spot. A leaked document published on Cyber Berkut hacktivist website alleges that Ukraine's Security Service has forbidden hospitals from revealing the real losses on the battlefield. The Kiev authorities have called an emergency meeting of the cabinet on Friday to discuss the situation in the east. It has been rapidly worsening since January 18, when Ukrainian troops have launched a massive assault on militia-held territories after an order from Kiev. Shelling of the rebel-controlled towns is done on a daily basis, including the metropolitan city of Donetsk with warring sides pointing fingers at each other. On Monday Ukrainian Prime Minister Arseny Yatsenyuk imposed a state of emergency in the war-torn south-eastern Donetsk and Lugansk Regions, while all other territories were put on high alert. Meanwhile the Ukrainian military draft for 2015 has come into effect. It’s expected to see 100,000 people joining the army in three stages throughout the year. Kiev authorities have revealed that since the beginning of the latest draft as many as 10,000 Ukrainian servicemen are absent from their posts. The Ukraine army’s chief of staff has admitted that Kiev troops are not engaged in combat with Russian units, thereby thwarting all Western allegations of Moscow's “military invasion,” said Russian Defense Ministry spokesman Igor Konashenkov. “Yesterday afternoon the Chief of the General Staff – Chief of the Armed Forces of Ukraine – Viktor Muzhenko officially acknowledged during a briefing for foreign military attachées that Russian troops are not involved in the fighting in the country's southeast,” Konashenkov said on Friday. Given the fact that Muzhenko directly supervises military operations in the southeast, “his statement is a legal fact, which thwarts numerous accusations made by NATO and Western states” concerning Russia's alleged “military invasion” in Ukraine, the spokesman dded. On Thursday, Muzhenko said “the Ukrainian army is not engaged in combat operations against Russian units.” He added, however, that he had information about Russian individuals fighting in the country’s east. He also said the Ukrainian army has everything it needs to drive off armed units in Donbass. His speech was aired by Ukraine's Channel 5 television, owned by President Petro Poroshenko. Muzhenko himself did not elaborate on the initial statement. Kiev began a military assault on eastern Ukraine's Donetsk and Lugansk regions in April 2014, after they refused to recognize the country’s new, coup-imposed authorities. According to UN estimates, more than 5,000 people have died as a result of the conflict. Since the start of Kiev’s military operation, Ukraine and Western states have repeatedly alleged that Russia has a military presence in the country's east. Moscow has refuted those claims on multiple occasions. Russian Foreign Minister Sergey Lavrov reiterated Moscow’s arguments on Wednesday, calling on those who believe the opposite to prove their point. “I say it every time: if you are so sure in stating that, confirm it with facts. But no one can or wants to provide them,” he said. The Organization for Security and Co-operation in Europe (OSCE) said it has not registered any movement of military vehicles at the Russia-Ukraine border checkpoints it observes, according to a statement made on January 22. Fighters of the notorious paramilitary battalion Aidar have rallied in Kiev against their disbandment, attempting to storm the Ukraine Defense Ministry’s HQ and accusing the regular army of deliberately shelling Aidar’s own positions with heavy artillery. Ukraine’s most infamous volunteer squad, the Aidar battalion – condemned by Amnesty International for its unmatched brutality in eastern Ukraine – allegedly came under Grad and Smerch rocket fire by the regular military near the town of Schastya in Lugansk region. Melnichuk and his fighters called the rally outside the country’s military headquarters on Friday, after the volunteer battalion was disbanded – or "rebranded" – according to the Defense Ministry. “The battalion was disbanded three days ago. It does not exist according to documents. The Minister of Defense and the Head of the General Staff say that they have not signed such an order. However, documents confirming that such a unit does not exist as well as the seal of a new unit have already been delivered to the frontline,” Melnichuk told Apostrophe publication. According to the battalion’s press secretary, Yuliya Evdokimova, the voluntary units are being disbanded“because it is detrimental to have voluntary battalions at the frontline.” All voluntary battalions will be “re-formatted into other organizations, merged with other brigades or other units, and thoroughly purged,” she told Ukrainian Pravda. However, the next day, the Facebook page of the battalion refuted the disbandment of the fighting force, claiming that Evdokimova does not represent the volunteer fighters. The confusion on the status of the battalion continued on Friday, as some 50 Aidar fighters rallied to show their “under-appreciation” by their own command. Formally, all volunteer territorial battalions are detachments of Ukraine’s Ministry of Defense. Melnichuk said that his squad “will not leave the frontline, no one will leave positions even if our own will storm us, and we have such instances,” as quoted by NTV channel. The commander told the Russian outlet that the decision to get rid of the nationalistically committed contingent arises from the unwillingness of Kiev authorities to pay for Aidar's services. “Now they have to pay our salaries, but if you disband us, no one has to pay anyone,” Melnichuk said. Melnichuk also claimed in an interview with Ukraine’s 112 channel that the central military command might have “got ahold of big funds” in exchange for surrendering Schastya to the rebel forces. Melnichuk claimed that when a similar deal was offered to him – $20 million in exchange for Aidar leaving Schastya – he turned it down. “To perform essential tasks, Aidar battalion will be strengthened further, and its soldiers equipped with everything they need,” the statement read, adding that changes were only made to the official seal of the unit, as its number designation has changed. “Blocking the Defense Ministry of a country at war, during the active battles at the frontline – is treason,”he said. A trolleybus has come under shelling in Donetsk’s Matrosova Avenue, TASS reported, citing a spokesman for the Emergencies Ministry of the self-proclaimed Donetsk People’s Republic. Five people in the trolleybus were killed, officials in the republic say, according to media. Initial reports said two people were killed. The representatives of the self-proclaimed Donetsk and Lugansk People’s Republics, Denis Pushilin and Vladislav Deinego, said they were planning to leave Minsk on Friday, Tass reported. Pushilin earlier said that he was unaware if negotiations between the Contact Group on Ukraine would take place in the Belarusian capital on Friday. A senior Ukrainian Foreign Ministry official said that peace talks on the conflict in eastern Ukraine must be attended by the leaders of the Donetsk and Lugansk People’s Republics. The self-proclaimed Donetsk and Lugansk People’s Republics are ready to pull back heavy artillery from the line separating militia-held territories from those under Kiev’s control in compliance with the Minsk agreement, according to a joint statement made by top officials of the republics on Friday. The statement said they will withdraw weapons if Kiev is ready to do to the same, adding that the only thing remaining is to “set the date.” The statement was made during talks between Denis Pushilin and Vladislav Deynego, the Donbass representatives at the Minsk negotiations. The Minsk document adopted by Kiev and the opposition in September also includes a ceasefire in eastern Ukraine. UNITED NATIONS, January 30. /TASS/. Kiev will regard the dispatch of a new motor convoy loaded with humanitarian aid to Ukraine as invasion, Ukraine’s Permanent Representative to the United Nations Yury Sergeyev said on Friday. Cargoes dispatched by Russia infiltrate Ukraine "without Kiev’s permission," to speak nothing of "participation of the International Committee of the Red Cross," Sergeyev said. "If a new convoy arrives, I think the twelfth, it will be regarded as invasion," the Ukrainian diplomat said. 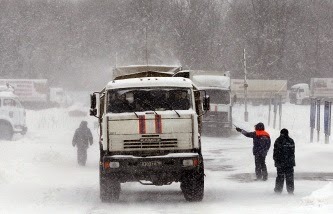 Earlier in the day, the Russian Foreign Ministry announced that a next truck convoy with relief aid for Donbass residents would set off for the region on Saturday, January 31. The convoy comprising 176 vehicles, with 157 trucks out of them, is expected to deliver nearly 1,500 tonnes of humanitarian cargoes, mainly foodstuffs (920 tonnes) along with medications and fuel and lubricants. Russia’s Emergencies Ministry organised eleven convoys with humanitarian aid to Ukraine in co-operation with international and public organisations from August 2014 to January 15, 2015, and delivered a total of 14,800 tonnes of humanitarian cargoes to Ukraine’s Donetsk and Lugansk regions. It was reported by the militiaman from the DPR. The militiaman from the DPR Evgeniy Kryzhin was at positions in Enakievo, he reported about this on his page in Facebook. ‘Uglegorsk is ours. It was stormed by militias from our squadron also. 2 militias were wounded’, wrote he. How it was earlier reported, the reinforcement of fighters from Azov arrived to Ukrainian occupants. According to the dates of fire-fights have been going on, the Army of the DPR finished the cleaning up. I don’t know who exactly (Turchinov? Poroshenko?) commanded the Ukrainian army to disrupt the truce. But I am sure that this decision was taken in Washington. It is not an accident that this suicidal provocation was preceded by the visit of G. Soros to Kiev. This elderly “philanthropist” who, together with the US Department of State, sponsored all post-soviet fascist regimes (from Saakashvili’s Georgia to Poroshenko’s Ukraine), was most qualified to assess the financial state of the regime in Kiev and to decide whether it still makes sense to continue prolongation of the agony by monetary injections. His public statement, reprinted by media on January 14, left no doubt - the patient is dead, the corpse is stiff, its resuscitation is meaningless. Surely, Kiev has understood that if they scrape the bottom of the barrel and if Europe exerts itself then it is possible to collect money for further agony. But Soros clearly said about the necessity to find $50 billion just for 2015. While in 2014 (when the ignoramuses still hoped for the stabilization of the Kiev regime) US, EU and IMF together could scrape up only $20 billion, supposed to be stretched over 3 years. In fact, in 2014 Kiev got only $7.5 – 8 billion in credits. Clearly, in such conditions it is unrealistic to find $50 billion in a year. Soros himself told that he hopes only for a miracle. Right after Soros’ unambiguous demand for the EU to finance Ukraine, the European media coverage of the Ukrainian crisis changed drastically, and it became clear that there will be no miracle. The European mass media (including German TV) and NGO’s (including Human Rights Watch) suddenly "saw the light" and found that the Kiev regime is at war with civilians, violating the laws and customs of war. Just a little bit longer and Europe will “realize” that Kiev is taken by a fascist junta that tramples its own constitution, and introduce sanctions against Russia for Kremlin’s economic cooperation (supply of coal and gas) with the Nazi regime. Europe is not going to give money. USA are not going to help either (if they wanted to do that, the IMF would not procrastinate for six months but allocated tranche after tranche, instead). Under these conditions, supporting Ukraine’s mythical stability, as Washington was doing since the end of last summer, is absolutely meaningless. Back in August-September of 2014, Ukrainian politicians were divided into two groups: the majority – those who were ready to overthrow Poroshenko, expecting to receive some dividends from the next coup, and the minority taking a neutral position. Poroshenko himself had neither his own support group nor power prop. He is still the president only thanks to the US, which banned the coup at the time. Washington knew perfectly well that Poroshenko is trying to negotiate with Moscow on the peaceful settlement (because only peace could give Poroshenko a chance to protect not just his presidential chair, but his life itself). United States needed a war and, seemingly, they did not want to keep the frightened and confused Petro Alexeyevich at the helm. But Americans were misled by Russian diplomacy. Peace was (and remains) beneficial for Russia, because it forces the United States and its European allies to keep the failed Ukrainian project alive and, therefore, to spend their scarce resources. The Ukrainian coup, intended to make from Kiev not only an eternal source of enmity between Russia and the EU, but also a black hole devouring Moscow’s resources, has not fulfilled any of its tasks -- a year after the coup, Ukraine continues to devour the US resources. But since Ukraine is just one of many sites of global confrontation between Moscow and Washington, the further concentration of efforts on this site becomes unprofitable for the US. They cannot quit, because then the site will be taken by Russia, which would be a geopolitical defeat of Washington. Therefore, the site must be destroyed. Let the winner occupy the ruins; if they could not entangle him by the whole Ukraine, let he be entangled by the rotting and decaying corpse of Ukraine. So, since for Russia it is better if Ukraine is destroyed by the US as late as possible, the Russian diplomacy pretended for almost a year, portraying weakness, confusion, and readiness to surrender. In anticipation of the fall of Russia, which would solve all their problems, the United States decided not to finish Ukraine. Why? If, after the victory over Russia, the problem of supporting the Kiev regime at the expense of Moscow would be solved by itself. But everything good comes to an end sooner or later. By the beginning of December it became clear that Washington can push Russia as much as it likes, but it cannot make Russia fall, without falling itself even sooner. Taking into account the need to reduce the geopolitical frontline, to concentrate resources on the remaining priority areas, to leave the lost grounds, the question resurfaced again – what to do with Ukraine? As soon as it became clear that Soros is not going to find the necessary finances for Kiev, the fate of the country, politicians, the public and even the “creative class” accustomed to be immune to problems, was sealed. And the war reignited with renewed ferocity. US knew perfectly well how unfit for action the Ukrainian army was and how the armed forces of DPR/LPR have strengthened during the peaceful respite. You don’t have to sit at the Chiefs of Staff Committee to estimate from open sources that with such intensive fights, which began on January 18th and continuing across the frontline, the Ukrainian army will run out of strength to conduct active operations in three to four weeks, and in one to three more weeks it will begin to fall apart. By the way, the Ukrainian artillery will be the first to disappear from the battlefield. Judging by the intensity and dynamics of the artillery fire of the parties, the Ukrainian army was behind DPR/LPR even on the volume of stored ammunition. While the republics clearly had a constant resupply, the Ukrainian army could not replenish consumable ammunition just as rapidly. After the Ukrainian artillery lost the opportunity of equal fight with the artillery of DPR/LPR, grinding of Ukrainian reserves was a matter of short time, and after the exhaustion of reserves the collapse of the front would became inevitable. Making up for the losses by means of mobilization was impossible, even if they could mobilize everyone. In the best case, the recruits would have been at the collection points, when the front already collapsed. Americans knew all that, but still pushed the Ukrainian army into a senseless attack, which could not even start in earnest. That is the army was doomed to destruction and the front was destined to collapse. Why did the United States need that? Because, as we mentioned above, the US does not need the unattainable victory in Ukraine, they need the destruction of Ukraine, but by someone else's hands and with the greatest possible benefit for themselves. Three to four weeks of intense fighting would not only bleed the Ukrainian army, but would also inflict substantial losses on the armed forces of DPR/LPR. From the first days, the militia admits its own losses of dozens if not hundreds killed and wounded, while noting that the losses of the Ukrainian army are much higher. Let us not forget that the armed forces of DPR/LPR currently do not exceed 30-40 thousand soldiers, even by the most optimistic estimates. Taking into account that 10-15 thousand are logistical and security units, there cannot be more than 20-25 thousand of combat troops. This means that even the loss of 3-5 thousand -- and this number of dead and wounded in three to four weeks of intense fighting is quite possible -- dramatically reduces the combat capability of the militia forces. So, by the mid-late February the Ukrainian army would have to fall apart and start a disorganized retreat, but the scarce militia forces, having suffered serious losses, would be unable to take the territory left by the withdrawing Ukrainian troops. This would create vast power-vacuum areas between DPR/LNR and Kiev, where the militia and some residual government troops would alternate to each other as in a layered cake. To the extent that different streets of the same locality could be held by different armed groups. In addition, while the DPR/LPR armed forces are organized as more or less regular structures with a unified chain of command, the army of Kiev keeps sliding to irregular formations, which, with the death of the last regular units, would finally transform to a bunch of Nazi gangs and outright criminals partially diluted by completely kooky “veterans of the anti-terrorist operation”. In this situation, Nazi battalions concentrated in the major cities of the southeast in order to maintain the power in Kiev, will grow more irritated and the Kiev propaganda will become more nervous. This would increase the bitterness towards the power that "betrayed us” as well as pro-Russian activists -- "the 5th column that stabbed us in the back". Any pretext will be enough to inflame the whole country. However, in order to paralyze the world community and to disable its instantaneous and consistent reaction, the pretext for the repeat of the Ruanda scenario (mutual senseless massacre) must be beyond belief and, at the same time, radically change the current political situation. 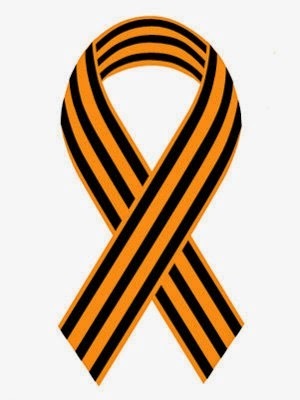 That is, it is not enough to organize a loud act of terror or a series of such acts on behalf of “pro-Russian partisans” or “FSB (GRU, SVR) agents”. This provocation must move the Nazi community and channel its efforts in the desired direction. Besides, the Ukrainian government must be (or look) paralyzed. Finally, this event should be sufficiently bloody, sufficiently immoral and touch those strata of the society, which are perceived by the Nazis as their own. These conditions cannot be satisfied with a single yet spectacular act of terror (such problems cannot be solved even by an explosion at Chernobyl). Clearly, first of all they would need death of a major political figure or figures, so that allegedly (or really) paralyzed Ukrainian government could not take measures to restore the order, even if it wanted to. Poroshenko is a perfect sacral victim (especially because he is a traitor to the Americans), but in place of the "young prodigy" Yatsenyuk I would have not relaxed as well. After liquidation of Ukraine, Yatsenyuk becomes useless and even dangerous as he can testify to some sort of "International Tribunal for the Former Ukraine." For a country without economy this symbolic economist is just as useless as the great banker Yuschenko. Credits are not coming with or without Yatsenyuk. To die heroically is the only benefit that he can bring to the US. If someone blows up the parliament during a plenary session with both Poroshenko and Yatsenyuk in attendance, could you guess who will be declared guilty even before any investigation? Especially if some "people's avengers" would claim the responsibility afterwards? Of course, the Nazis from battalions spit on Poroshenko and Yatsenyuk, but their battalion commanders will be there as well: Yarosh and sotnik Parasyuk and cossack Gavrylyuk – it would be so indecent not to avenge them. Moreover, if this seems not enough, they could carry out a series of terrorist attacks in the hospitals where the "heroes ATO" are treated. Imagine how barbaric killings of defenseless "heroes" will be presented by the Ukrainian media. They will not even need a training manual from the American Embassy; they will interpret everything correctly by themselves. Well, and as "the cherry on the cake" one can explode the cascade of the Dnieper hydropower plants. This would solve several US problems at once. First, the real damage as a result of flooding will not be as great, but cameras positioned in advance in the right places will show pictures more terrible than during the tsunami in Thailand, and "experts" (incidentally, also on their own initiative) will immediately proclaim millions of potential victims. Second, this will immediately cut off the left bank of the Dnieper River from the right one. The dam will be blown, and bridges destroyed. That is, the militia will not able to cross the Dnieper without the help of the Russian Army. Third, if all this (from the elimination of the political elite to the man-made technological disasters) happens in three to five to ten days and if it becomes possible (sure it does, otherwise, why are we feeding CIA?) to accuse Russia and DPR/LPR of participation or at least of indirect sponsorship of the terrorists, the consolidated international community will not take quick control of Ukraine. Any participation of Russia will be blocked by the West accusing Moscow of complicity in the crime, but Western forces themselves could not stabilize the situation (even if the US and the EU decided to act without a UN resolution, they will not have the required operational capacity and available troops). Fourth, while the US needs that, even Turchinov can legitimately represent Kiev and lead the remnants of the government, which is dispensable as well. The further course of events is also clear. The Nazis go to avenge their “brothers in arms”. The battalions spread out across the country, checking addresses from databases provided be fellow Nazis from the SBU and parts of the Ministry of Interior. The militia will still be able to quickly lend a helping hand to Kharkov, Left Bank districts of Dnepropetrovsk and Zaporozhye, to punch a land corridor to the Crimea. But without Russia’s help they cannot go further - there are no bridges. Left bank guerrilla groups are stronger. Of course, they will resist in Odessa, possibly even in Kiev, but the forces are not equal. The mere fact of partisan resistance on the right bank will deprive the junta of the support of the Ukrainian "creative class". Nobody needs them in the US, because they cannot work, but like to eat well. Nobody will feed them for their "Ukraineness" (who needs Ukraineness without Ukraine?). Each of them doesn’t know much, but taken together their testimonies would allow to piece together the full picture. And if in the course of Ukrainian excesses they will be killed in their own homes, so be it. "Tutsi" kill "Hutu", "Hutu" kill "Tutsi" - this is a sad feature of civil wars. Thus, pushing Ukraine from Somalization to Ruandization, the United States are fully capable to minimize the effect of Russia’s victories, cover the traces of their own crimes with blood and, most importantly, make their participation in the coming settlement not just necessary, but inevitable, thus preserving their positions on the European continent and their control over the frightened EU. We considered just one scenario of the possible provocation that would allow Washington to solve the problem of burning down the Ukrainian stand. In fact, there are hundreds of similar scenarios. All of them are real, and some of them must be already developed by the Americans. Otherwise, the security services, the military and the State Department are paid for nothing. The number of crimes already committed by Washington and Kiev suggests that the above scenario is not something extraordinary, on the contrary – it is well within the logic of the previous actions. In February 2014, a hundred of “Maidan” victims stimulated the coup; three hundred victims in the downed "Boeing" allowed to deploy the summer offensive; tens of thousands of killed Ukrainians serve as a means to pressure Russia. Then how the tens of thousands of victims are different from the hundreds of thousands or even millions? Only by the fact that the US did not have the need to organize a mass human sacrifice in Ukraine yet. Now there is such a need. Putin’s traditional ability to come up with a decent way out of most desperate situations. But these things are beyond the scope of rational analysis. They are matters of luck. Rostislav Ischenko, president of the Center for system analysis and forecasting, exclusively for the “Current Comments”. "We are the hollow men We are the stuffed men"
Eleanor Catton: "a culture of fear and hysteria"
A war between Hezbollah and Israel?